The Royal Mint has once again proven its impeccable dedication to producing British coinage that faithfully represents the nation's rich heritage. Sixth in the immensely popular ten-coin Queen's Beasts series, The White Falcon of The Plantagenets was designed for the British Royal Mint by the highly respected engraver, Jody Clark. As with the five previous releases, the intricate detail captured on the image is truly awesome! This exceptionally beautiful edition showcases a stylized design of the Falcon of the Plantagenets - first used by Edward III of the House of Plantagenet as his badge. The coin’s increased popularity and spectacular design make it a cherished gift and a one-of-a-kind addition to any coin portfolio. Made from 99.99% pure gold with a weight of 1 oz. Issued by the prestigious Royal Mint. Struck in Brilliant Uncirculated condition. Carries a 100 GBP face value. 6th issue in the cherished Queen’s Beasts series. Legal tender coin in the United Kingdom. 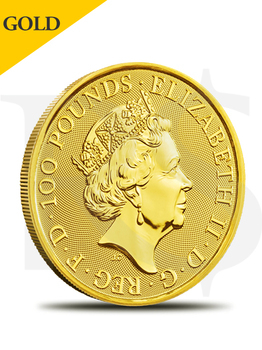 Obverse: features the 5th definitive coinage Portrait of Queen Elizabeth II, surrounded by the text "ELIZABETH II • D • G • REG • F • D • 100 POUNDS". DG REG FD is an abbreviation of the latin "Dei Gratia Regina Fidei Defensor" meaning; "Grace of God, Queen, Defender of the Faith" and is a form of the Style of the British sovereign of Queen Elizabeth II common on coins of the Pound Sterling. The initials of the artist Jody Clark appear just below the portrait. 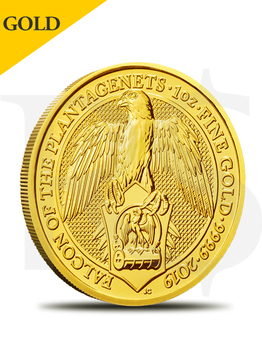 Reverse: The reverse features a stylized rendition of the The Falcon of the Plantagenets surrounded by the text "FALCON OF THE PLANTAGENETS • 1 oz FINE GOLD • 999.9" and date of mintage. The initials of the artist Jody Clark appear just below shield offset to the left.